According to the pricing of TIPS and Treasuries, the bond market has decided that the negative inflation shock of falling oil prices has run its course. In fact, inflation expectations have been rising since year end: the bond market now sees inflation (of the CPI variety) averaging 1.7% over the next five years, and 2.0% from years 5 through 10. With the labor market having improved in recent months and long-term inflation expectations now back to levels that the Fed deems appropriate, it's only a matter of time before the Fed begins to raise short-term rates. This long-awaited "normalization" of rates should come as no surprise and should not in any way threaten the health of the economy or financial markets. 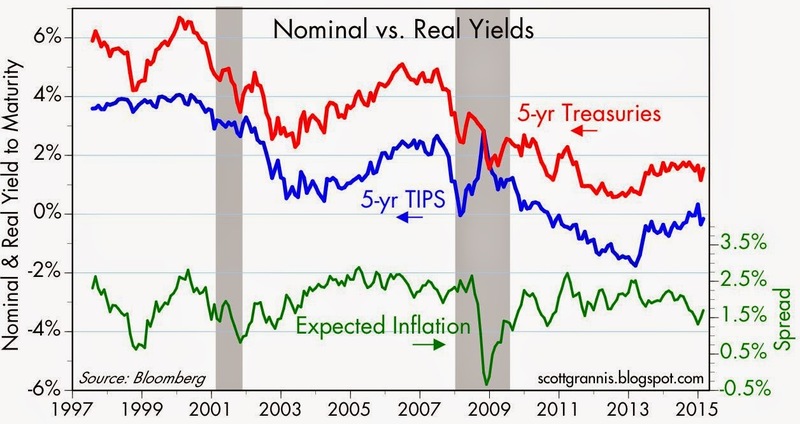 The chart above shows the nominal yield on 5-yr Treasuries, the real yield on 5-yr TIPS, and the difference between the two, which is the market's expected average annual inflation rate over the next five years. 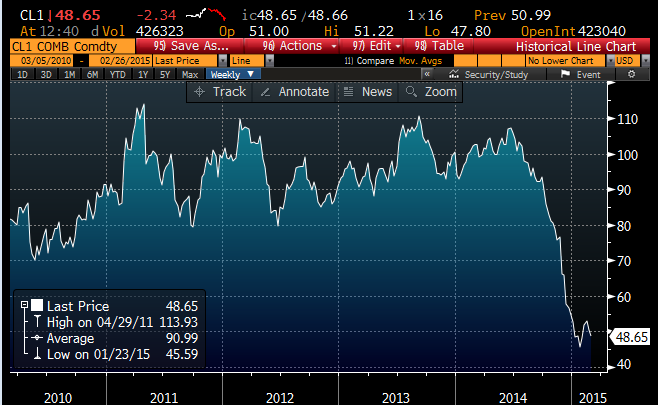 Inflation expectations began to fall last summer, about the same time the oil prices began to decline. They reached a low of 1.2% late last year, and closed today at 1.7%. The chart above shows the price of crude oil futures; note that prices have stopped declining and have been relatively stable since early January. Investors have been speculating that the bounce in prices marked the end of oil's decline, and the bond market action is confirming this. The price of wholesale gasoline futures (see chart above) has actually been rising in the past month: in fact, prices today are up 35% from their mid-January low. 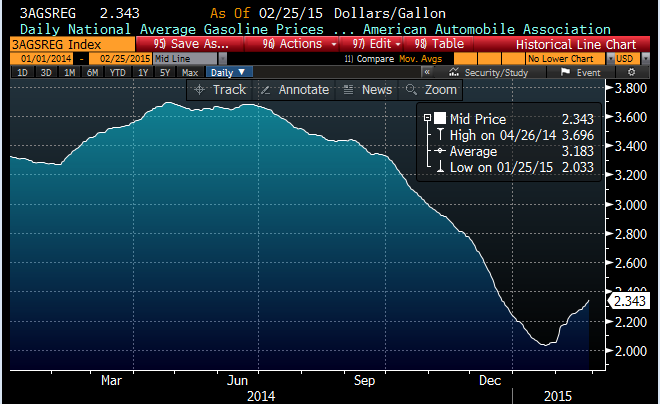 Gasoline prices at the pump have also been rising, as the chart above shows. 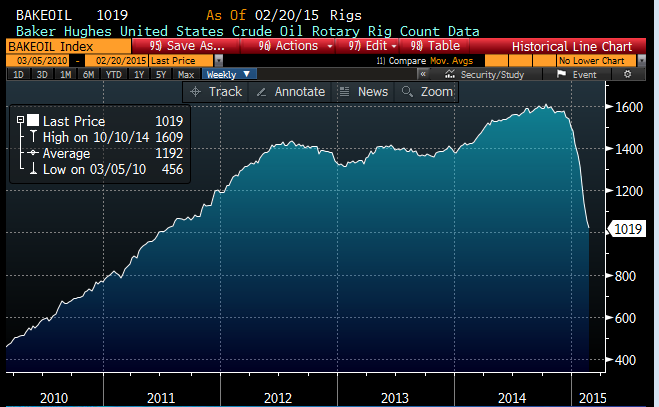 The rise in oil and gasoline prices could prove to be the proverbial "dead cat bounce," but the significant decline in active oil drilling rigs (chart above) confirms what the market is saying about oil prices having hit bottom. Lower prices are having the predictable effect of shutting down exploration efforts, which, in turn, will lead to reduced oil production in the near future. Supply and demand are likely to come back into balance somewhere around the current level of prices. 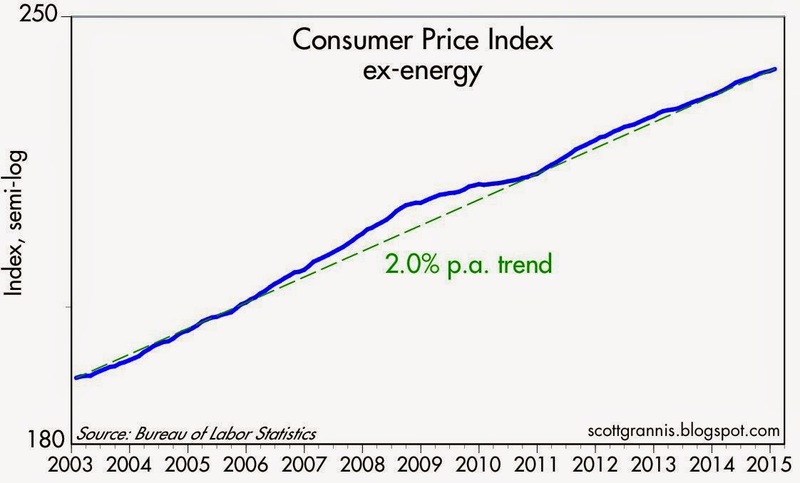 As the above chart shows, inflation ex-energy has been running right around 2% a year for the past 12 years. The market is saying we're likely to see more of the same in the years ahead. The result of falling oil prices is thus likely to be stronger growth rather than lower inflation. The Fed is correct in ignoring the recent decline in inflation. The chart above looks at inflation expectations over the next 10 years, which are now around 1.8%. 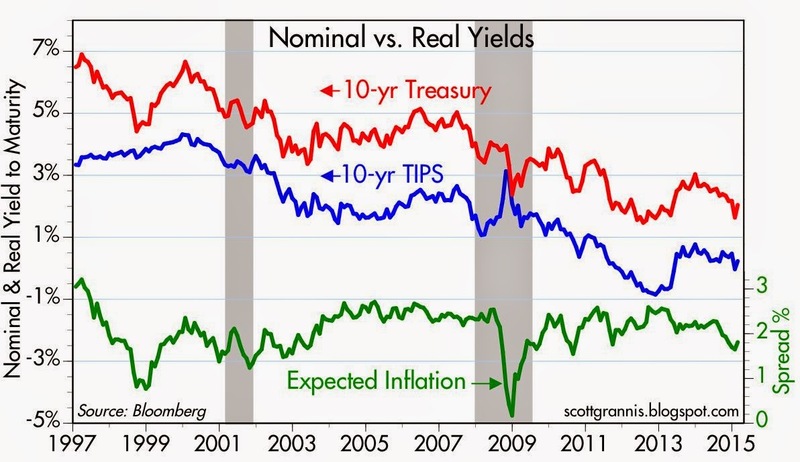 Even though inflation expectations are back to "normal," the real yields on TIPS are very low (see chart above). 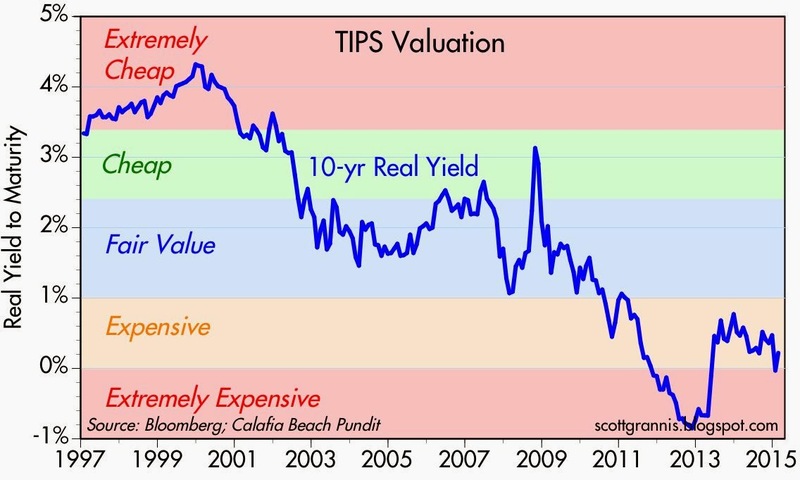 The market is not afraid of inflation being any different than it has been in the past (~2%), but the very low level of real yields (and the correspondingly very high level of TIPS prices) suggests that the bond market holds out very little hope for any meaningful pickup in the outlook for real economic growth. TIPS are very expensive at these levels. Investors are willing to accept an almost insignificant real yield in exchange for protection against uncertainty. Rather than cheering cheaper energy, the market continues to worry about the lack of growth and opportunity, and is willing to pay up for safety. 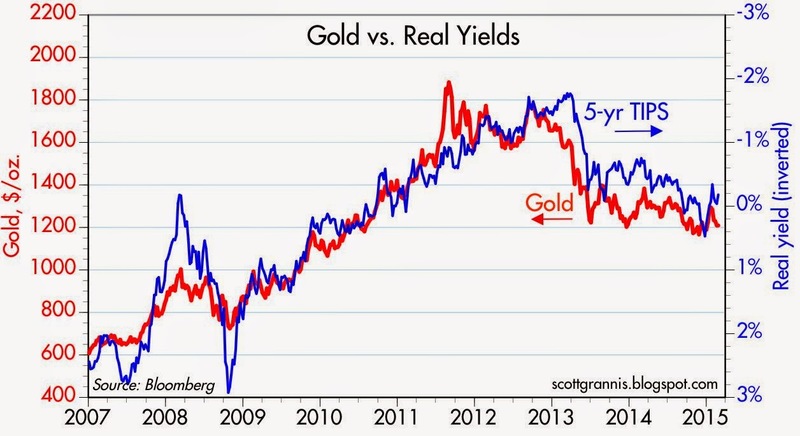 This same preference for safety is seen in the chart above, which compares the price of gold with the price of 5-yr TIPS (using the inverse of their real yield as a proxy for their price). Both assets are still trading at fairly high levels from an historical perspective. This suggests that the market is still dominated by pessimism, not optimism. In a very optimistic market environment, the price of gold would be an order of magnitude lower, and the real yield on TIPS would be north of 3%. We are many years away from either. The market may be right in its belief that inflation will remain in a 1.5-2% range and economic growth will remain sub-par. But if the market is wrong, I'm willing to bet that both growth and inflation will prove higher than expected in the years to come. I'm optimistic if only because the market seems to be still so pessimistic. UPDATE: As of 8:00 am PST 2/27, markets have continued further in the direction of higher inflation expectations: the expected inflation rate for the next five years has increased to 1.8%. The real yield on 5-yr TIPS has fallen to -0.3%, which points to an even more cautious market. Lots of capital everywhere---"too much money chasing too few deals." Interest rates should be low---supply and demand. ECB and BoJ printing money, QE. Time will tell. So Where is the Real Asset Bubble??" Over the past five weeks, net Taxable Bond Fund flows have increased by $38.5 billion while Equity Funds have suffered a $2.2 billion out flow. While the biggest banks have cut back on their positions, it’s steadily migrated to insurance companies and mutual funds. Such firms have boosted their holdings of corporate and foreign bonds to $5.1 trillion, a 65 percent increase since the end of 2008.
william, so let me get this straight. the US credit market is some $40 trillion with corporates making up 25% of that and we're supposed to worry about a $38 B inflow? literally a drop in the bucket. What say the inflation hawks in response to negative interest rates? For 30 years, inflation and interest rates have been in decline. I said they hit bottom at zero. I was wrong. There is less than zero. You are right, Benjamin, less than ZERO interest rate on 5 year notes for a few EU countries, including recently Germany. But, I keep thinking it has been a 32 year bull market in bonds!! The US 10 year note last month hit a record low of ~ 1.7%. How many years or months are left in this bull?? Scott seems to see the extremely low rates as a response to FEARS; but I see them more as examples of reaching for yield - an over confidence, over exuberance. How can negative yields be symptomatic of "reaching for yield?" I continue to believe that the very low (and even negative) yields on high quality debt are symptomatic of a strong desire for safety; risk aversion is abundant. Low interest rates can perhaps also be explained by supply and demand. If there is "too much capital" then some of it has to lose value. That can happen through bad returns on the stock market, or negative interest rates. The supply of capital may not be market-determined if there are huge sovereign wealth funds, and large insurance and pension funds, globally, continuously accumulating capital by law or regulation or government diktat. The catbird seat is held by those who can show they can deploy capital advantageously--guys with good business plans. Bain & Co, has a not-bad report out on the global capital glut. Looks like this will be with us for a long time. You also have a world in which for the first time in history there are lots of people with the ability to save. China, India, Japan, S Korea, Taiwan, Europe. Mideast. And capital barons (thugs) in Russia, elsewhere, siphoning off billions for deposit in Western banks. I hate to say it, but passive investing is a tough road in the years ahead. I might advise people to get their hands dirty, invest in an operating business and take a position in the company, or buy a rundown quadplex and fix it up, that sort of thing. Trying to outsmart several other million (and usually smart) investors in overcrowded capital markets might be a trick. After hands-on dirty work, once you have a desirable asset fixed up, you can name your price (well, within reason). The Cleveland Fed says public expects 1.53% inflation over next 10 years---I think on the CPI. The Fed is undershooting even its too-tight inflation target. Why?